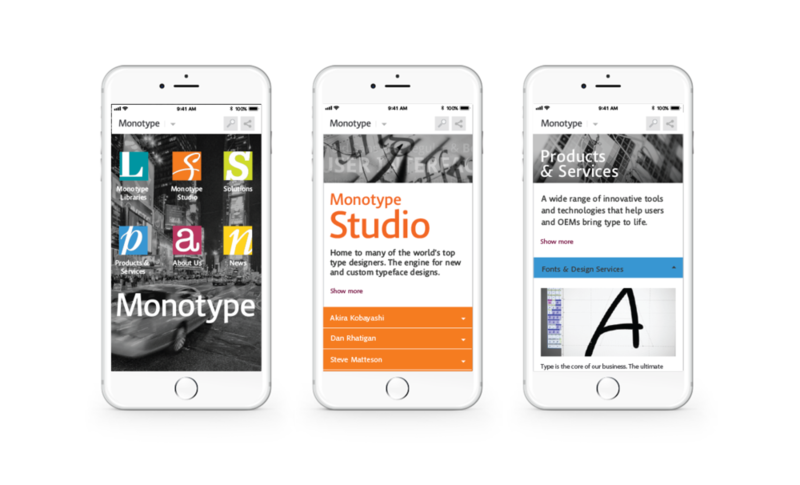 Monotype is the leading global provider of type design, type technology, and type expertise, had conducted a brand study and determined that their user base did not truly understand who they are and what they do. They engaged Busse Design to help them design their new, responsive corporate website in a phased approach. The first phase presented a very aggressive timeline with only 11 weeks from start to launch, which included the development of the CMS by DevBridge as well as the creation of mostly new content by Libretto. Busse Design’s assignment was to completely overhaul the Monotype website information architecture, and create a new visual brand identity based on Monotype’s existing mood boards. After an extensive Discovery phase, our first step was to create a Global Site Map that identified content that would be available in the first phase, second phase and in the future, and called out any differences among a desktop and mobile versions of the website. 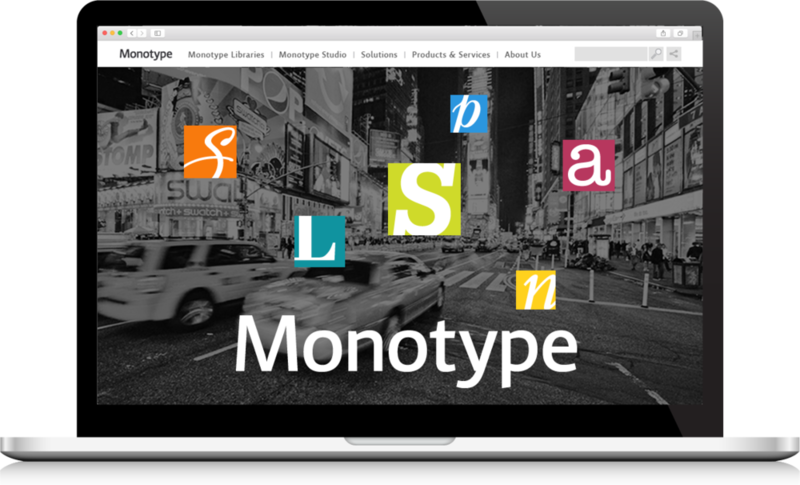 With this overall architecture in place, Monotype was able to begin their content plan with their content partner, Libretto. Our lead information architect then created UI Sketches or wireframes for key pages of the site. Because the plan was for the site to be ultimately built using responsive design, we provided UI Sketches for the pages across all breakpoints for the various platforms (desktop, mobile, tablet). Moreover, our hi-fi UI Sketches provided the content team with word counts for the website. Once the layout and structure were locked, Busse Design provided Monotype with three visual design directions that explored various approaches to imagery, type usage, and scale; and ranged from a conservative approach to a more dynamic, innovative option for all breakpoints. 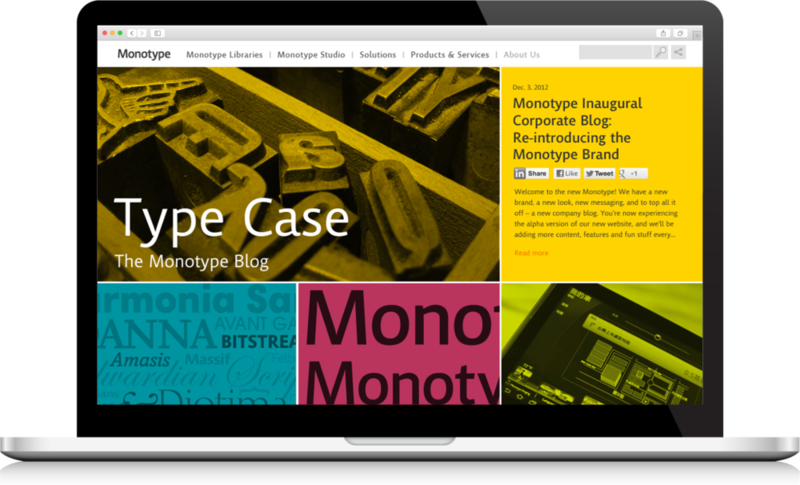 Monotype selected a design approach with some revisions, and we applied the design to all the remaining desktop pages for the first phase. 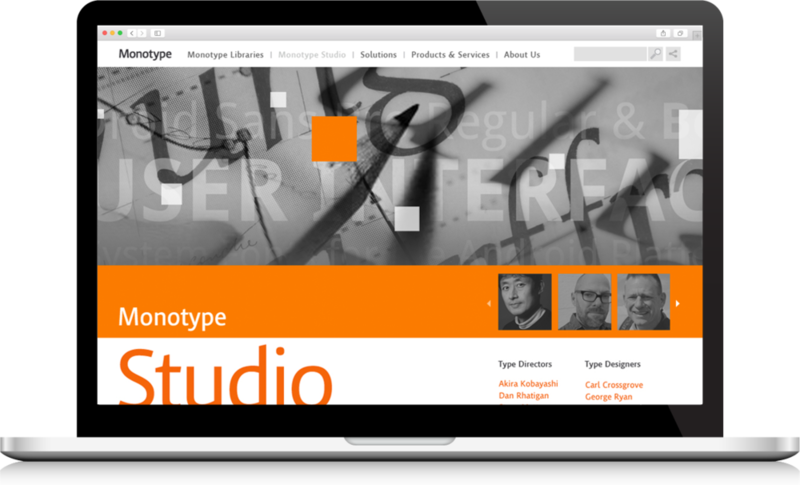 At the same time, DevBridge, Monotype’s development partner, began building out the desktop website. Busse Design also provided HTML Templates for a website hosted by a third party.